The first time I saw a plastic bait used in salt water was on a cold, windy night in Florida. Snug in my humble trailer, space heater going, north wind blasting, I was watching a fellow on a television show say how he used long freshwater worms to catch the mighty tarpon in one of the Sunshine State&apos;s many fishing holes. 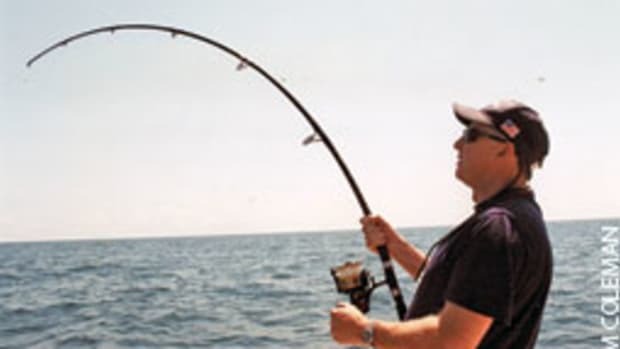 That show sparked some thinking, and we started experimenting with plastic worms back home, targeting striped bass from Westport, Mass., to Fishers Island, N.Y. At first we caught schoolies, but in time we landed bass to 35 pounds. Today, 8- to 12-inch plastic worms rigged on a 1/2- to 1-ounce lead head are a staple of casting along southern New England&apos;s rocky shores. 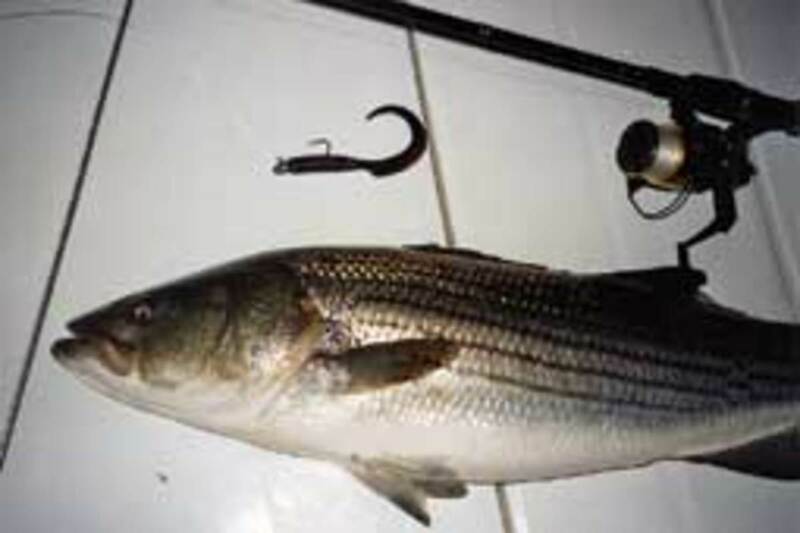 In addition to plastic worms for stripers, anglers in the Northeast have turned to other plastic baits to catch both the prized striper and other saltwater species. 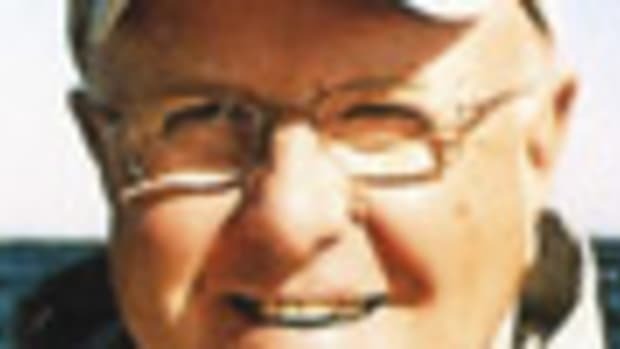 The late Capt. 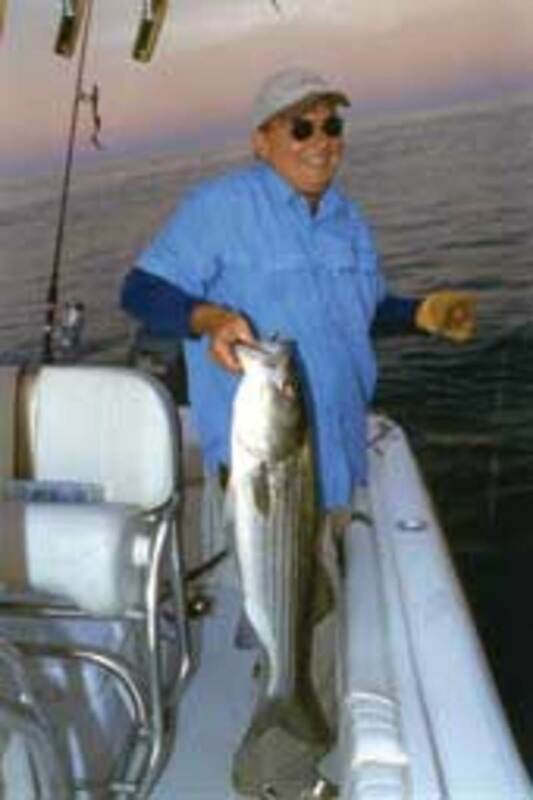 Don Cameron often would troll 6-inch plastic shads made by Storm or Tsunami for late-November bass and large bluefish off Charlestown, R.I., after clearing Quonochontaug Breachway. 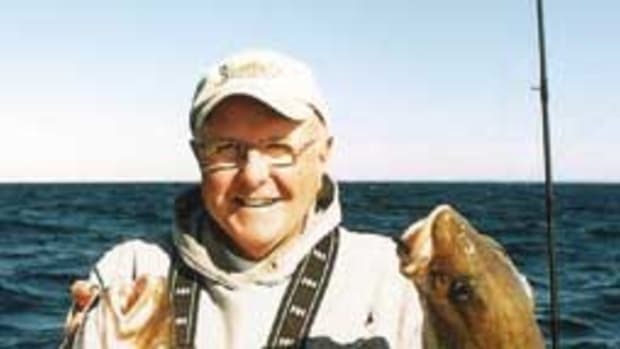 Fluke anglers discovered that they could use a lead head or bucktail dressed with a plastic bait of some type, and further dressed with a strip of squid or a large spearing. The artificial/natural combination is worked along the bottom in short hops, attracting summer flounder of all sizes, from sublegals just off the beach to doormats caught around structures in water as deep as 140 feet. At that depth, heavier bucktails are called for, though with today&apos;s super-thin braids you can get by with less weight than with monofilament. On a foggy morning when we were just starting to experiment with plastics, Capt. Charley Soares and I came out of the mouth of the Westport River in Massachusetts and into a white wall. Not wanting to tempt fate by fishing close to the rocky washes, we dropped plastic worms on 1/2- to 1-ounce lead heads to the bottom just outside the mouth of the river, drifting back toward the mouth on the flood tide. Slowly yo-yoing the worms up and down on the sandy bottom, we landed a dozen or so fluke. Not a great catch, but the plastics saved the day from being scrubbed. 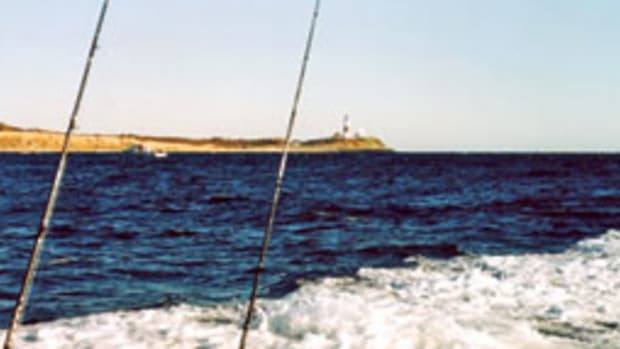 A little to the west, off Rhode Island&apos;s Sakonnet Point Lighthouse, we started a bass trip one fall morning to find bonito tearing into small bait. At first, the fast swimmers ignored poppers and metal tossed their way on conventional 40-pound-test bass leaders. Doing away with the leaders to fool the sharp-eyed critters, we tied the 12-pound mono directly to a lead head with a 6-inch plastic worm cut back to resemble the size of the bait. The turnaround wasn&apos;t as dramatic as we hoped, but we did land three of the target species before they pulled anchor and sped off to parts unknown. Plastics also will produce codfish when used ahead of a standard cod jig as a teaser. My good friend Capt. Greg Mercurio, of Yankee Capts, sells 8-inch plastic worms aboard his party boat. The wiggle of the worm lures cod and pollock, often resulting in a "double" - that is, fish on both the jig and teaser above. Anglers also are using Slug-Gos, another great plastic, as cod teasers. Some rig a straight shank 5/0 to 7/0 hook on a dropper loop ahead of a cod jig and then thread a 6-inch Slug-Go on the hook. They drop the jig-and-plastic combo to the bottom in 170 to 200 feet of water off the east side of the north end of Stellwagen Bank, where cod to 20 pounds have abounded the last three summers. Last summer, I watched Nate Jermain thread a 9-inch Slug-Go on an 8/0 hook on a dropper loop above a bank sinker. This was dropped to bottom and yo-yoed up and down like a jig and teaser, the dancing plastic too much for cod to resist in the deep waters on the east side of Stellwagen Bank. 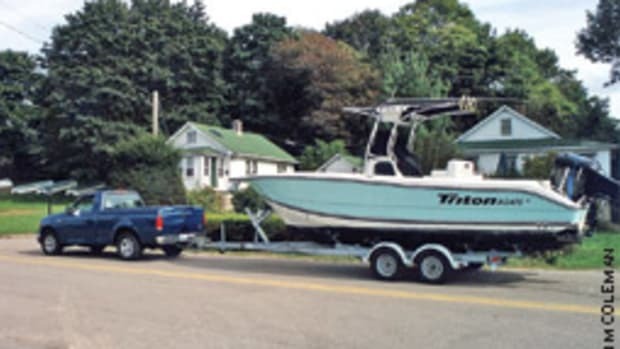 Nate&apos;s father, Dave, also told me tuna anglers are using the 9- and 12-inch versions of the Slug-Go and the Hogy, a Slug-Go look-alike, around Stellwagen. They&apos;re getting hits on fish over 200 pounds, boiling after the slow-trolled plastics rigged with appropriate hooks to withstand the hard-pulling bluefin that do not give up easily. Northeast anglers also are catching school bass, blues and weakfish in the rivers and back bays on different plastics rigged below a popping cork. These are used extensively in the South, the concept discovered by some on their winter vacations and imported back home. The corks come in a variety of shapes and sizes, but all make noise in the water when popped with a pull on the rod. The noise attracts fish in quiet waters. When they investigate, they see the plastic bait hopping around beneath the float, looking very much alive and a prime target for a meal. In the spring, anglers around the famed west wall of Point Judith Harbor of Refuge in Rhode Island use the 3-inch version of the Cocahoe Minnow, rigged on a 1/2-ounce or heavier lead head, to catch the first of the schoolies. Up the Thames River in eastern Connecticut, anglers favor the same size or larger Zoom Fluke, also rigged on a lead head, to catch the last of the holdover bass that will be moving out of the river on their migration to the east after spending the cold months in Norwich Harbor and upper parts of the river. 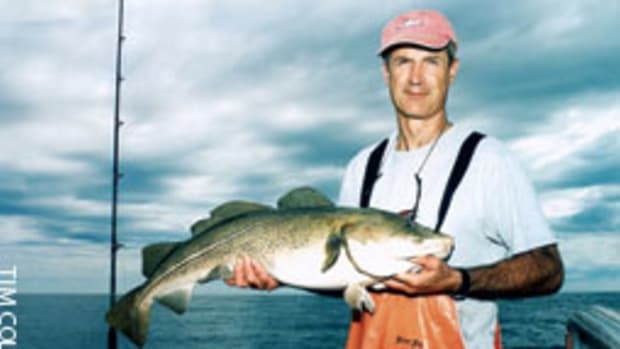 Both of these baits also will work during the spring run in salt ponds, where the fish often stop for rest and food, much like snowbirds making the north-south trek. Some small-boat anglers use plastics in conjunction with a popper, much like the popping cork setup. They take off the plug&apos;s back hook and replace it with an 18- to 24-inch leader with a small plastic bait underneath. The plug gives casting weight, and the plastic lure works up and down while the popper "pops" along the top. Some fishermen keep two rods rigged and ready. 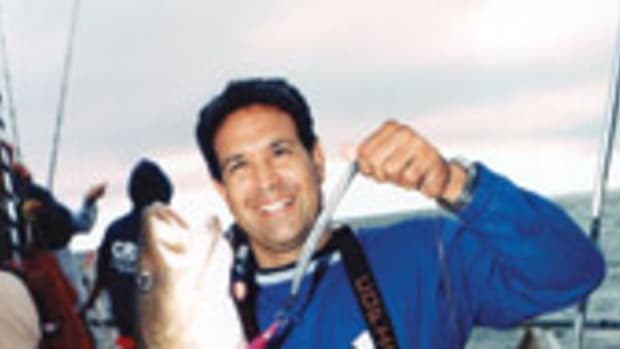 If a spring bass comes up after a popper some quiet evening after work but will not hit again, they can sometimes get the fish to hit a second time by casting a plastic bait to it, fooling it with a different look. Plastic baits have proved themselves worthy, producing time and time again from the sleek bluefin to the tasty fluke. They are a saltwater staple that likely will see more uses and tricks uncovered - a whole new world to be discovered. Tim Coleman has been fishing New England waters for most of his life. 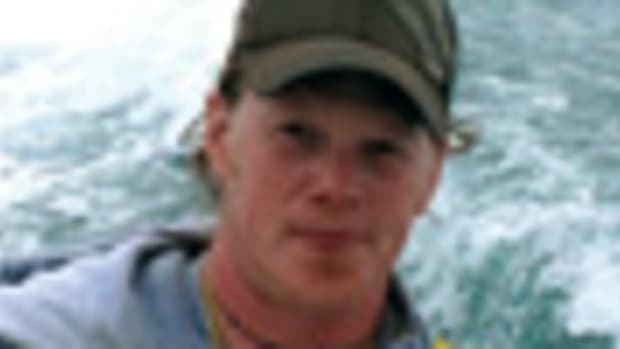 He was managing editor of The Fisherman magazine&apos;s New England edition and is now a freelance writer based in Rhode Island.